After Hurricane Katrina tore through Corrie Spano’s neighborhood in 2005, she found herself waiting in line with what seemed like the entire Marrero community outside the town’s only open supermarket. Though it took some time, Spano and her fiancé, Marshall Goree, decided to start their own urban garden at home. Half of their 20-by-60-foot yard is dedicated to growing food, while the other half is free for the younger of their four kids to play, Spano says. The couple first grew herbs to help soothe tummy troubles and aloe plants for burns, and later made their own soaps and lotions. Spano, 43, and Goree eventually planted beans, cucumbers and melons on trellises to maximize space. Today the garden has expanded to seasonal crops of blueberries, tomatoes, peppers, lettuce, spinach, squash and even a few citrus trees, Spano says. While urban gardening has been a trend in New Orleans since Katrina robbed many neighborhoods of grocery stores, urban farming and gardening has become a necessity in the rest of the world. According to the Food and Agriculture Organization of the United Nations, 800 million people worldwide practice urban agriculture – including horticulture and raising livestock – making up 15-to-20 percent of the world’s food supply. Tracy Breaux falls squarely into that number. She not only grows fruits and vegetables in her Broadmoor backyard but also raises her own chickens. She began to research the project about three years ago when her oldest son, Madden, who has an Asperger syndrome-type disorder that prevents him from connecting with people, expressed an interest. His school had a common garden and a chicken coop, and Madden asked if the family could raise chickens, too. 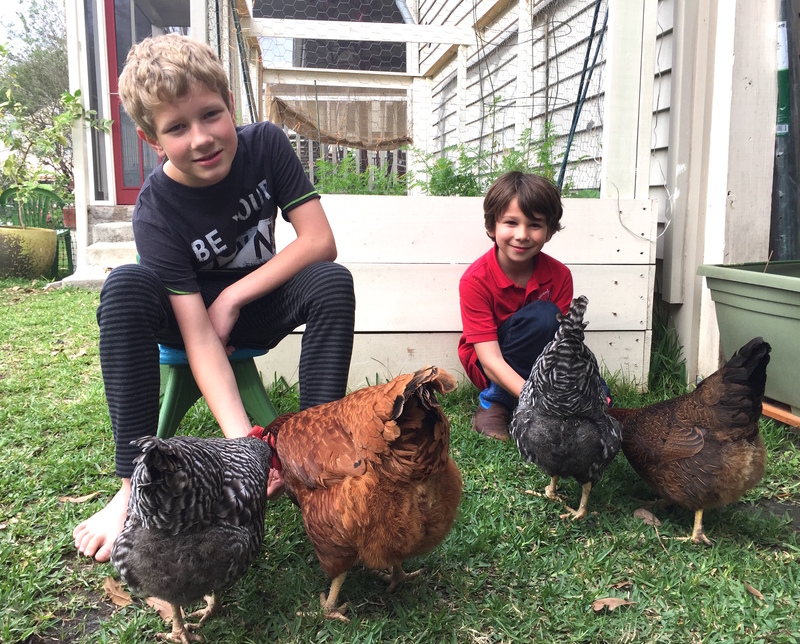 It took nearly a year of researching the city’s laws on chickens before the family brought some birds home, says Breaux, 44, who lives with wife Manette, Madden and their three younger children – Myles, Cecilia and Harper. The family initially purchased some chicks and a ready-made coop from a local feed store but soon learned several of the chicks were roosters. That was a problem because city law prohibits roosters because of their loud crowing. “We would get them. (Madden) would bond. They would crow,” Breaux says. 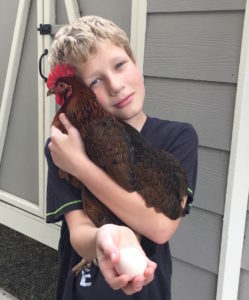 Madden Breaux with one of his family's chickens. They gave the roosters to a farmer in Mississippi and next ordered only female chicks through the mail. The family selected Rhode Island Red, Plymouth Rock, Barred Rock and Dominique chickens, and built a raised coop with an enclosed run in their backyard, Breaux says. All of the children have responsibilities – Madden feeds and waters the chickens each day, and the other children help collect eggs, sweep up and play with the birds to keep them domesticated and friendly. The therapeutic benefits of raising chickens for Madden, now 12, have been “absolutely golden,” Breaux says. There is no pressure for Madden to speak to the chickens, and he has even trained them to sit on his shoulder while they search for snacks under the bricks lining the family’s garden. The chickens are otherwise kept away from the family’s raised garden bed, where they grow lettuce, spinach, carrots, cabbage, green onions, rosemary, cilantro, dill, tomatoes and peppers, Breaux says. The chickens help engage their children in a slower, self-sustaining lifestyle where they can learn to help provide for themselves, Breaux says. Breaux acknowledges that having the time and resources to garden at home is a luxury that not everyone has. That was the impetus more than a decade ago to create the Edible Schoolyard New Orleans program, which integrates hands-on organic gardening and seasonal cooking in school curriculums for children who have spent most of their lives living in a busy city. “We’re really trying to change how kids eat, learn and live at our schools,” says Claudia Barker, chief development officer for FirstLine Schools and executive director of Edible Schoolyard New Orleans. The Edible Schoolyard program is available at five FirstLine schools, a network of open-enrollment charter schools serving 3,000 students in pre-k through 12th grades. The program is the first replication of chef and food activist Alice Water’s flagship Edible Schoolyard program in Berkeley, Calif.
By tending school gardens and preparing the healthy food they grow, students are learning how to improve their long-term well-being and that of their families, Barker says. The schools where the Edible Schoolyard program are located serve a high-need population, Barker says. Most of the students qualify for free or reduced-meals, and most are students of color who may be more vulnerable to heart disease and diabetes – all preventable diseases advanced, in part, by poor food choices, she says. The joy of learning to cook inspires students to go home and share what they have learned, Barker says. Gentilly resident Jamella Mitchell says she believes the Edible Schoolyard program has benefited her daughter, Daryelle. The 16-year-old junior at Joseph S. Clark Preparatory High School has led school culinary classes as head chef and is considering a career in the culinary arts, along with engineering, her mother says. 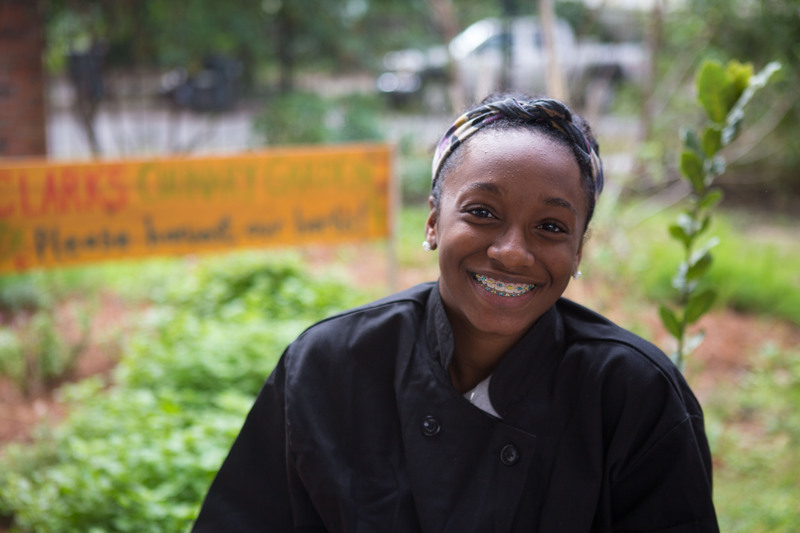 Daryelle Mitchell, a junior at Joseph S. Clark Preparatory High School, works in the school’s garden and culinary arts kitchen as part of the Edible Schoolyard New Orleans program. “I just think the program has been a big help for the education and awareness of how we produce and prepare our food,” Mitchell says. After all, while food in New Orleans is delicious, “If you are what you eat, we might be a lot of canned goods and sugar,” she says. Kate Stevens is a journalist and mother of two whose work has appeared in Nola Family, The Times-Picayune, The Advocate and The Charlotte Observer.